The green star juicer is one of the best juicers on the market! This juicer is superior in extracting all the vitamins and minerals from fruits and veggies. There is no heating, or shock, to the enzymes of any food passing through the juicer's gears because it operates at a low RPM. It has a twin gear technology and a magnet surrounded by bioceramic materials that enhance the freshness of the food. Years ago highly regarded Dr. Norman Walker proved it's power through experiments. When fruits and vegetables are slowly ground and compressed toxic metals like lead and mercury bind with the pulp and are removed from the juice. Simply put, the BEST juice! The innovative technology behind this juicer ensures a high quality juice and versatility like no other juicer on the market. It preserves delicate nutrients that other juicers can destroy from heat build up. When you put the best juice into your body you will be amazed at the positive effects it will have on you. Diseases can disappear, your skin glows and heath issues are of the past. Don’t get me wrong, any fresh juice is good for you - but if you want the best for your body - this is the juicing machine to consider. Is not only because it produces the best juice with max nutrition, but because of it’s ability to prepare many healthy meals. It can do more than a single gear juicers. 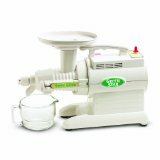 The Green Star juicer works as a food mill for preparation of baby foods, sorbets and nut butters. It can also process whole foods, making favorites like almond and date pie crusts, pates from nuts and vegetables, sauces from a vast array of ingredients, baby foods, frozen fruit desserts and more. It easily juices herbs and grinds nuts and grains. It can juice fruits and vegetables of ANY kind. It can easily juice hard roots (carrots or ginger) to fibrous stalks (celery or rhubarb) to even the toughest leafy greens (kale, wheat grass). It is superior in juicing out every drop of nutrition from fresh produce. You’ll never have to wonder if your juicer can juice different types of produce. You’ll have very dry pulp with little waste. If you haven't seen this video from raw food chef Jenny Cornbleet be sure to watch it. She is making a green juice and explains how it is so delicate even on greens. And if it's that careful on greens, you know that it's extracting the best from other produce as well. The clean up is easy (we all like easier clean up!!!) from it’s “automatic pulp ejection” design for continuous juicing. The Green Star Juicer brand has 4 models. The 1000, 2000, 3000 elite and Gold. They are basically the same machine, with the higher models offering different options and attachments for use. The Green Star-3000 and Gold models come with a pasta maker set and a breadstick/mochi maker set, which adds value and fun. The 1000 and 2000 vary in a few options like a pulpy juicing screen.. I personally think the Green Star 3000 is the best value. If you get a lower model without the few extra optional attachments, know that you can purchase them any time. Since there are many options, it is very common for people to do this. If you aren’t sure if you’ll use the extras, the way to go would be the 1000. The Green Star juicer isn’t cheap but totally worth the investment. Don't be afraid of used/refurbished models that are cheaper. The key to remember is that it will last a lifetime, no doubt. Instead of buying several so-so juicers, this is a juicer you can rely on to provide the best juice for the longest time period. The Green Star’s low speed functionality creates little noise and produces juice with optimum nutrition. It can juice any type of produce from very soft fruits to hard and fibrous veggies- even wheatgrass. You’ll get the best juice out of anything you choose to juice. You’ll be able to make pastas, nut & soy milks, nut butters, frozen desserts, as well as grind nuts and grains. Even better, the Green Star Juicer has a five year warranty. In the very unlikely event that you would even need it, it’s there! Peace of mind that it will last for you. The Green Star is THE juicer. They are endorsed by top chefs like Juliano & Jenny Cornbleet and health enthusiasts. It is known for its durability, reliability, low-speed, and heavy duty functioning. It is highly regarded in its field of twin gear juicers, and a top seller across the world. This is one of the most dependable, sought after and unparalled juicers available. It outshines any of it’s juicer competitors and has won more awards then any other juicer! Simply fantastic. If you purchase this juicer, it will be one of the best decisions you have ever made because it is the key to living a healthy lifestyle. Your health is SO important…and this juicer will help you meet high standards for putting the best in your body. If you want to know more about the Elite, the best of the bunch, here's a review of the Greenstar Juicer Elite.